Mercury Poisoning can occur due to numerous sources of contamination, including eating fish, industrial exposure, amalgam fillings, and vaccinations. View our page on mercury toxicity and potential alternative treatments for mercury poisoning and mercury toxicity. Synopsis: Monte Ross, a 68 year old male with Diabetes, used healing clay to heal a severely infected toe that was being treated by wound care specialists. After unsuccessful treatment, the medical staff made the decision to amputate the toe. The day before the surgergy, Cano introduced Monte to clay therapy. After one week, there was a marked improvement. After 35 days, Monte was released from medical care. In our experience, Monte's experience is NOT an 'exception to the rule'. We would expect to see such results each and every time, especially if the wound has been properly debrided. 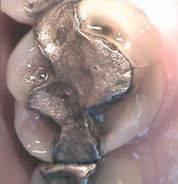 Of course, we would also strongly suggest the use of electrically isolated silver and ozone for the toughest cases. My name is Monte Ross and my Wife is Connie. I am a 68 year of diabetic with an ongoing problem of poor circulation that results in numbness in my feet. In June 2007 we were living in West Yellowstone, Montana and very busy preparing to move to Burnet, Texas. Connie noticed I was tracking spots of blood on our kitchen floor. To our dismay we found a sizeable cut on the bottom of my right big toe containing all sorts of debris and a deep cut. I didn’t feel anything. Connie doctored my toe often with an antibiotic cream but the nasty cut wasn’t healing and began to have a sickening odor. We were concerned about the toe, plus my blood sugar was jumping all over the place. After only a few hours into our trip to Texas I started getting overly tired and weak along with severe dizzy spells. Connie had to drive us to Texas. The second day we were in Burnet I began to have real strong chills. I was outside getting some sun when the chills became violent. Suddenly, I passed out and didn’t remember anything until I woke up in the emergency ward at the Seton Hospital in Burnet. After two days the Doctors in Burnet evaluated the condition of my toe as being so serious as to need a specialist. They transferred me to Seton Hospital in Austin, Texas. When the Wound Care Specialist opened up the top of my toe they found an infectious hole running through the flesh and out the bottom. Consequently, fluid to clean the hole went in the top and came out the bottom. I had an ugly staph infection which was “a very bad smelling mess.” They treated me with a lot of antibiotics for a few days, but the condition was getting noticeably worse. Dr. Timothy Gueramy, Who is an Orthopedic Surgeon, and Dr. J. Todd Bagwell, who is an Infectious Disease Consultant decided it was necessary to amputate the toe in order to save the foot. My brother Jerry Ross told me about a friend of his named Cano Graham who is the author of the book ‘The Clay Disciples.’ Jerry felt I should talk to him. Mr. Graham came to see me on October 5, 2007 and discussed the subject of using a particular clay therapeutically to stop the infection. He got my attention because it so happen I was scheduled for surgery the following day. I told the physicians that I at least wanted to try the clay before they took my toe off. They agreed to try…….but the hospital administration declared I couldn’t use clay in the hospital. I was sent home with the serious admonition that if the toe didn’t show immediate improvement, then quick amputation was mandatory. The Girling home care people came on a regular basis with IV antibiotics etc.. Mr. Graham suggested Connie push his clay into and though the hole and apply the clay four times a day and a generous amount last through the night. After a week, the Girling nurses and the Doctors at Seton were (in their words) ‘amazed’ at the marked improvement. After only thirty five days of clay therapy both Drs. agreed….. “We don’t understand how his clay works……but it works.” Then came the words Connie and I wanted to hear. Connie and I are extremely thankful for my brother telling us about Cano and his Therapeutic Clay. Our prayers were answered! 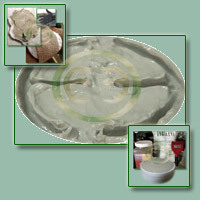 "Clay is the most versatile, profoundly effective, cheap, mysterious, underrated, covered-up health treatment available. "I know this because I am a natural health professional who uses clay personally and professionally for healing and health maintenance. I research and read everything I can find on the therapeutic use of clay. I have seen clay perform "miracles." I get very excited about mud. And in case you think I got my diploma out of a Cracker Jack�s box, rest assured; I have a bonafide Masters Degree..."
"...Bentonite attracts and neutralizes poisons in the intestinal tract. It can eliminate food allergies, food poisoning, mucus colitis, spastic colitis, viral infections, stomach flu, and parasites (parasites are unable to reproduce in the presence of clay). There is virtually no digestive disease that clay will not treat. It enriches and balances blood. It adsorbs radiation (think cell phones, microwaves, x-rays, TVs and irradiated food, for starters). It has been used for alcoholism, arthritis, cataracts, diabetic neuropathy, pain treatment, open wounds, diarrhea, hemorrhoids, stomach ulcers, animal and poisonous insect bites, acne, anemia, in fact, the list of uses is too long for this article. It was used during the Balkan war of 1910 to reduce mortality from cholera among the soldiers from sixty to three percent." 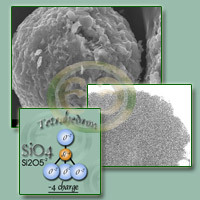 Read more about bentonite clay minerals in our section dedicated to bentonite articles. 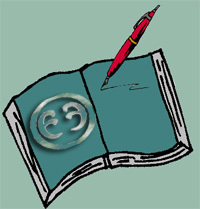 Eytons' Earth has had well over 10,000,000 page views since its inception in 1998! 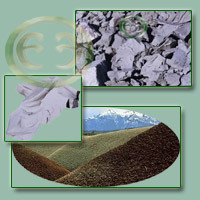 Eytons' Earth, a non-commercial, public awareness organization dedicated to researching the values of healing clays (bentonite, illite, zeolite and montmorillonite), is based out of Las Vegas Nevada. Feel free to us at any time. While we are not always able to respond, we do our best to answer non-commercial inquiries!